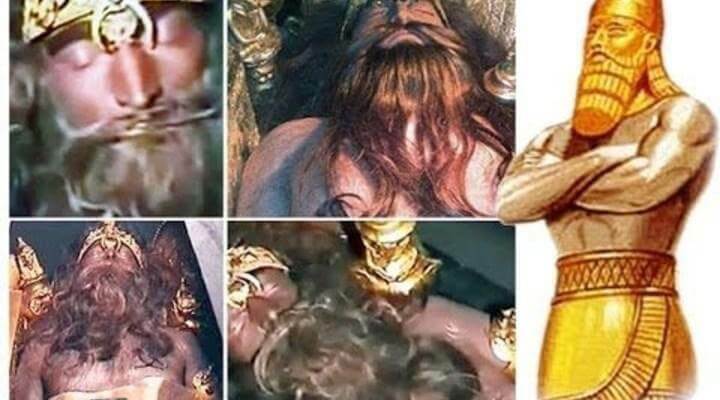 Home » Are Prehistoric Giants Waiting in a Stasis Chamber in Iran? A few days ago, a pair of YouTube videos started making the fringe history rounds, alleging to depict the discovery of two incorruptible bodies in Iran in 2008, bodies that date back more than ten thousand years. Depending on which version of the videos you happened to encounter, you might see the bodies referred to as those of Gilgamesh and Enkidu, or those of the Anunnaki, specifically Enki. This is weird, but not for the usual reasons. We will dispense with the videos themselves first. They show what seems to be tourists filming inside a museum or exhibit of some kind. We see what at first glance appears to be two dummies wearing reproduction gold artifacts inside modern boxes set up to show how warriors or kings were once buried. The videos, in turn, go back to at least 2012, when Russian websites began writing about them and claimed one belonged to the magician Jaromir. The Russian website shows what seems to be a living man wearing a fake beard taking the place of one of the dummies in a couple of still photographs. But that’s not what makes the videos interesting. Martin Mikuaš, who posted heavily edited versions of the videos with musical accompaniment this week attributed the videos to Russian media, where longer versions can be found. But when running images of them through Google Images, we quickly discover that the videos also appeared several months earlier on David Wilcock’s Gaiam-TV subscription-only streaming show. (Disclosure: Gaiam-TV, an offshoot of the Gaiam yoga empire, offered me $200 a month last year to write a column for them on the condition that I refrain from any skepticism; I declined.) Gaiam-TV is now Gaia TV. Anyway, Wilcock shares the Cosmic Disclosure program with Corey Goode, a UFO conspiracy theorist and alleged precognitive who says that he learned all of the mysteries of the ancient earth while participating in a “secret space program.” The episode in question, S01E06 “Sleeping Giants,”must have aired sometime this summer, but Gaia doesn’t give specific dates for the episodes of its shows. On the program, Goode claimed that he learned from “smart glass pads” in the “secret space program” that ancient giants used stasis chambers to preserve themselves within Native American burial mounds and other ancient constructions. Oh, and of course these giants were red-haired super-white Caucasians: “very large giant humans with reddish beards. And their skin, because of the pale white, they look kind of gaunt.” But according to Goode, the giants were merely reusing alien technology; they were not the inventors of the stasis chambers. He adds that Abraham Lincoln had viewed one of these stasis chambers and referred to it when he mentioned in a scribbled note to a lecture that a “species of extinct giants” were buried in the mounds, a reference to the then-common belief that mounds were the work of the Nephilim. It is perhaps noteworthy that Wilcock quickly recognizes that the mix-and-match props surrounding the “Sumerian” giant aren’t Sumerian: “So one of the things that struck me about this was the Egyptian, clearly Egyptian female head on that golden plate that’s in there. And then, this very strange little statue, of this guy that has two snakes coming up from the sides, almost like something out of Hinduism.” But instead of taking this as evidence that the video isn’t a genuine Ice Age tomb, Wilcock and Goode quickly agree that the Aryan super-giants had artifacts from “crossover civilizations”—despite, by their own admission, having been buried 8,000 years before those civilizations arose! It’s perhaps interesting that while Goode blathers on about “stasis chambers” in pyramids, he can’t offer even a modicum of evidence for it. It’s sad that today you don’t even have to pretend to do research to make ridiculous claims. When the “stasis chamber” claims were first proposed in the 1970s, earlier ancient astronaut writers like Alan Landsburg at least managed to cite specific myths and artifacts to support (however spuriously) the claim. You’d think that someone supposedly as “educated” about ancient mysteries as David Wilcock might have been able to relate the “stasis beings” in their sarcophagi to the strange beings Al-Maqrizi reported that the Arabs had found on glowing beds within the Great Pyramid: “They entered the central chamber in which were three transparent and luminous stone beds and on these three beds lay three bodies covered with three robes. Near the head of each was a book in unknown characters” (Al Khitat 1.40, my trans.). Or, if you’re really into beards, the European legends of the Sleeping King might be a good place to start. I mean, seriously: at least try to come up with something. The clues that Wilcock himself recognized—the multicultural props, the Russian titles on the video, etc.—all point toward a vastly different conclusion that Wilcock wants, but he wouldn’t make much money telling his audience what they don’t want to hear. That probably explains why neither Wilcock nor Goode expressed the least curiosity about the origins of the video. “They had all Russian titles on them, but they’re obviously not from Russia,” Wilcock said. “It’s Middle Eastern, most likely. Turkey and somewhere, maybe Egypt.” Surely, if you thought you had proof of giants in Pleistocene stasis chambers you might be just a smidge more curious about where the video came from. Oh, and maybe you’d like to note that the objects around the body, including a newspaper and (in photographs) the cameraman’s finger, show that this was no giant.